I remember in the mid 1980s when my grandfather got our family’s first video camera. I was only about 6 years old at the time, so in my mind I instantly became a movie star. I still have those videos today, they remain close to my heart. My grandfather was the only person I knew who had owned a video camera at the time, so I was led to believe that the idea of owning an amateur video camera was some sort of new technology. However, as some of you who were around in the 60s and 70s likely know, this is not correct. In fact, during this time, a fairly low-quality amateur video camera, which some of your friends and family may have owned, were turning kids of the 60s into movie stars as well. The Kodak Super 8mm camera was one that could turn any ordinary Joe into a movie producer. The production of these cameras, which started in the 60s, continued until the early 1980s, when they went out of production. In 2014, however, a company called Logmar Camera Solutions introduced a new Super 8mm camera to market — the first in nearly 30 years. For one man, named JS Gauthier, the idea of using a Super 8 camera was one that always piqued his interest, but in doing so, he didn’t simply want to create an ordinary movie. Instead he elected to combine other modern-day technology in order to make his own unique ‘replacement animation film’. 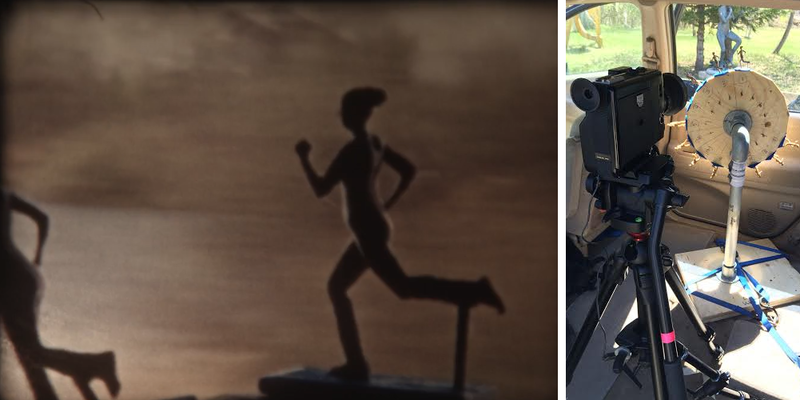 His end result is a video which you can see below, entitled “THE RUNNER”, which features a woman running overtop a background of the streets of Saskatchewan, Canada. In all, 14 different poses were 3D printed, including 12 frames for the run cycle and 2 still poses. Once they were 3D printed, they were then glued onto a wooden wheel which Gauthier could turn in from his Super 8 camera as he drove down the highway, shooting double frames to a scenic spot on the banks of the South Saskatchewan River. As you can see in the video below, the unique effect that Gauthier was able to generate from combining his camera with the 3D scanning and 3D printing of his partner, is quite interesting. Check out the video below.